The conservatives’ strategy is to reap what victories they can while Malcolm Turnbull leads. If the Turnbull government’s present agonies become death throes and the election is lost, coping with opposition will test to its very core a Liberal Party that in power has been fractured and self-indulgent. For a start, would the conservatives, who at the moment have an ideological mortgage over the party despite moderates holding some key cabinet posts, be able to foreclose and, if so, with what consequences? It’s almost two years since a widely hailed moderate prime minister overthrew a conservative one. Yet in many areas Malcolm Turnbull has not been able to assert his authority over the party. Instead, he has been forced to, or chosen to, accommodate the right’s demands and embrace senior conservatives as his closest ministerial confidants. 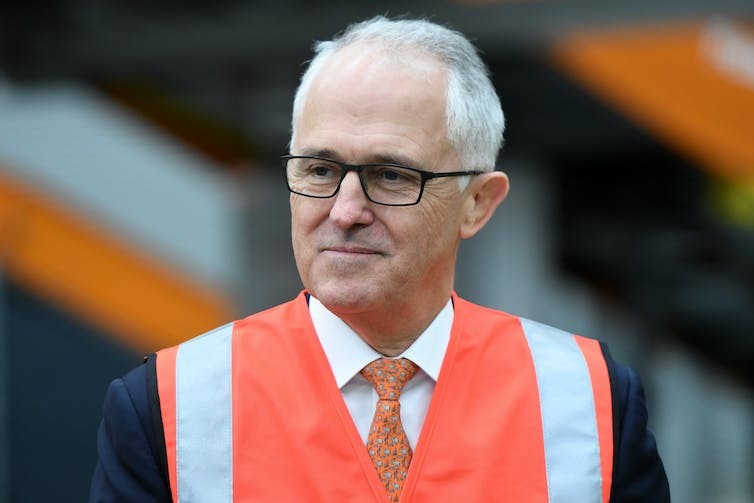 The conservatives’ very effective strategy – from their own point of view if not electorally – is to reap what victories they can while Turnbull leads. But their real moment could be in prospect if he loses (assuming he takes the party into the election). It would depend on who emerged as leader – which in turn would be affected by the size of the defeat and the composition of the post-election party. But conservatives, already shaping the internal debates, would seem well placed in the field of successors. Peter Dutton, their hardman, has gone from the minister Turnbull didn’t want on cabinet’s national security committee to the prime minister’s adviser and protector, recently rewarded with the creation of the proposed home affairs portfolio. Dutton can afford to be a mainstay of Turnbull’s praetorian guard. His best chance of leadership lies in Turnbull losing and his pitching as the tough Tony Abbott-style headkicker the Liberals might think they need in opposition. Meanwhile, the immigration minister burnishes his right-wing credentials by relentlessly milking the border protection issue, assiduously feeding friendly Murdoch tabloids, and maintaining a warm dialogue with 2GB shockjocks. If not Dutton – who could conceivably lose his marginal Queensland seat – the Liberals would be looking at Scott Morrison, Abbott, Christian Porter (also vulnerable in his Western Australian seat), Josh Frydenberg and Julie Bishop. Morrison is an ideological chameleon, so it would be hard to predict where the Liberals would head off to under him. While his stocks have receded, in opposition he might be viewed as a compromise. Abbott would surely be seen as yesterday’s dog. Porter, a former WA treasurer and attorney-general, arrived with much promise but so far has lacked the popular touch. Frydenberg probably wouldn’t be regarded as ready. Bishop doesn’t appear up to – or up for – years of opposition slog, and would likely quit parliament. Of this list, only Bishop is (sort of) a moderate; Frydenberg is (sort of) centrist. The lack of moderates in the succession list is notable, given Christopher Pyne’s ill-judged boast to that faction that it was in the “winners’ circle”. It’s not, if we are talking about future leaders. Nor is it articulating, in the sense of a broad manifesto, what the party stands for, according to moderate lights. This failure to proselytise – something they did diligently at times in the past – is one source of the moderates’ current weakness. For the most part, Turnbull has failed to chart a philosophical path ahead for the Liberals. Buffeted by political circumstances, bad opinion polls and determined internal critics, he has lacked the opportunity or will to do so. Or perhaps, as a primarily transactional politician, he doesn’t have the intellectual bent for that sort of task. Turnbull’s much-talked-about July speech in London, in which he said the Liberal Party belonged in the “sensible centre” – a phrase he’d taken from Abbott, though each would identify the centre’s content differently – generated intra-party controversy without inspiring the followers. In contrast, Abbott has the time, inclination and intellectual heft to set out directions, with numerous articles, speeches and radio interviews. While Abbott has only a small band of loyalists in personal terms – because he’s seen as electorally unpopular and as someone undermining the government’s chance of surviving – he espouses positions supported by many other conservatives within the party and their commentariat sympathisers. The response to Pauline Hanson’s burqa stunt in the Senate highlighted the divisions among Liberals over some basic values. Attorney-General George Brandis tore strips off Hanson in a spontaneous and emotional speech, drawing a standing ovation from Labor and Greens. Education Minister Simon Birmingham – one consistently gutsy moderate voice – tweeted support. But positive reaction from the government benches in the Senate was more muted. A Sky ReachTEL poll taken after Hanson’s action found 56% support for a burqa ban. Brandis lost out in Dutton’s win on the planned home affairs department, but managed to retain responsibility for approving warrants for ASIO activities. In the battle for the party’s soul Brandis may think he has little to lose by taking a stand. He’s under pressure to quit the parliament at the end of the year to open the way for Turnbull to reshuffle; it’s not clear whether Brandis would or could seek to stay a while beyond that. Given the conservatives’ present power in the Liberal firmament, it is worth revisiting Brandis’ 2009 Alfred Deakin lecture, in which he argued that the party’s much-heralded “two traditions” – conservative and liberal – theory “was a specific contribution of John Howard’s”, rather than a historical feature. “This awkward blending of two different systems of values was very much a reflection of John Howard’s own personal values, shared by no other significant Liberal leader. Alfred Deakin, Robert Menzies, Harold Holt, John Gorton, Malcolm Fraser were all happy to describe themselves simply as liberals. Howard was the first who did not see himself, and was uncomfortable to be seen, purely in the liberal tradition,” Brandis said. In that lecture Brandis also pointed to the contest, when a party goes into opposition, between those who want to be brutally honest about past failings and those seeking to defend the legacy. Unless a lot changes fairly quickly – and admittedly the election isn’t due until 2019 – extolling a rather scattered Turnbull legacy might be a challenge. In government, the Liberals’ own goals have given Labor many breaks. In opposition, the challenges in getting their act together would be considerable. The broad right is already splintered, with Cory Bernardi’s Australian Conservatives, Pauline Hanson’s One Nation and, toward the centre, the Nick Xenophon Team all competing with the Liberals and Nationals. If worse came to worst, the right could fragment further in opposition. There was muffled talk previously of those from the Queensland Liberal National Party wanting to sit as a separate group, although this isn’t considered practical. If their vote held up better than that of the Liberals, the Nationals would likely be angry with their partners after a rout. They are already blaming Liberal ineptitude for the Coalition’s woes – although the crisis over Nationals MPs’ citizenship saw the exasperation suddenly flow the other way. A blame game would make harder the adjustment to the loss of power. While unrelenting negativity can be an effective path for an opposition, as Abbott showed spectacularly, there is no guarantee it is enough. Bill Shorten has picked up a good deal from the Abbott playbook, but Labor under him also has a quite strong, and in parts daring, policy agenda. The Liberals could not simply rely on a Shorten government being a shambles. They would need to develop over time a positive program – and one that connected with ordinary people, rather than being in an indulgent la-la land of the hard right. Much would depend on leadership in a party that turns on the axis of the person at the top. That takes us back to the apparent problems of succession. Of course, there might be nothing for the Liberals to worry about. Turnbull – with his device of covering uncertainty with the definitive declaration – assures us the government “will win the next election”. Many of his colleagues just wish they believed him.